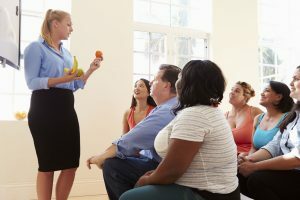 We offer group classes centered on healthy food options our clients can learn to prepare at home, as well as educational classes focused on making healthy diet choices when healthy options don’t always seem available. We schedule one-on-one meetings in our office or on-site for those individuals seeking nutrition analysis and healthy eating options. Our trained dietitians will review your current eating habits, the importance of keeping a food diary, while outlining healthier food options for your consideration. The goal of one-on-one counseling is to educate first, and answer questions so that healthier eating routines can be established. ServSafe® training classes are available on-site or off-site. Call to discuss your tailored needs.